Turkish Prime Minister Erdoğan and ousted Egyptian President Morsi attend a news conference in Ankara (Photo: Reuters). Turkish Prime Minister Recep Tayyip Erdogan has refused to speak to Egypt's new Vice-President Mohamed ElBaradei, the latest broadside in a spat that erupted after the military coup in the Arab world's most populous country. Erdogan infuriated Egypt's interim leaders after he voiced support for ousted Islamist president Mohamed Morsi. "How could I speak to you? You were not elected, you were appointed by the orchestrators of a coup," he said on Wednesday, addressing ElBaradei in remarks carried on CNN-Turk's website. ElBaradei, a prominent liberal and former head of the UN nuclear watchdog, was sworn in on Sunday as part of a new cabinet appointed after the July 3 military overthrow of Morsi. 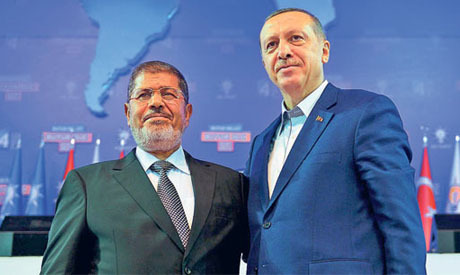 Erdogan, leader of the Islamic-rooted Justice and Development Party (AKP), had branded the coup as an "enemy of democracy" and said Morsi was the only legitimate president of Egypt. He said he had received a letter from ElBaradei seeking a telephone conversation after his comments. "They don't like what we are saying; they are uncomfortable with it," Erdogan said. "They said certain comments were made without full knowledge of the facts." The interim government in Cairo on Tuesday voiced "strong resentment" at Erdogan's comments about the overthrow of Morsi, Egypt's first freely elected president. Relations between Turkey and Egypt had strengthened during Morsi's year in power.